Embarrassed to have backyard parties because of the efflorescence (salt deposits) on your concrete patio pavers or brick landscape walls? 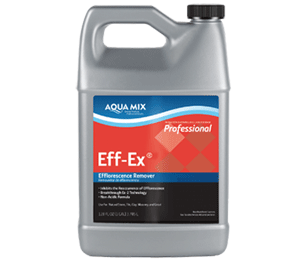 No need to cancel your summer party plans, because Aqua Mix Eff Ex is your summer patio savior! 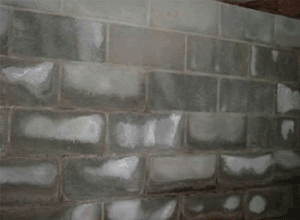 Efflorescence (primary) is a cosmetic problem that can occur in natural and built environments. This deposit happens when water moving through a wall or other structure, brings salts to the surface that are not commonly part of the cement stone. The visible white, salt deposits are left behind as the water evaporates. These white deposits are known as “efflorescence. ” Because the salts that are brought out of the cement stone are not ordinarily a part of them, this makes primary efflorescence aesthetic issue only. With this type of primary efflorescence, there is not structural concern. Aqua Mix Eff-Ex is suitable to use with primary efflorescence. 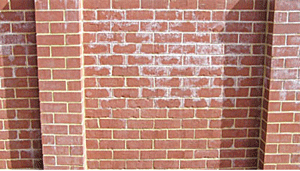 Primary Efflorescence often occurs on masonry construction. could have structural problems (Secondary Efflorescence). 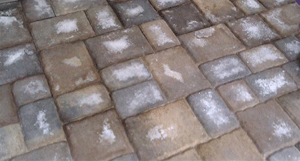 Patio bricks/pavers with primary efflorescence In the case of Secondary Efflorescence, contact professional. To rid your masonry surfaces from the pesky and ugly deposits, and to help prevent further efflorescence, use Aqua Mix Eff-Ex. 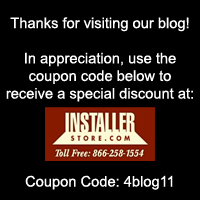 The easy-to-use product removes and inhibits primary efflorescence. This non-acidic, heavy-duty cleaner can be used on interior and exterior approved surfaces (see list below). **Aqua Mix Eff-Ex cannot be used on polished marble, polished limestone, or polished travertine surfaces. Read entire label before using. Do NOT dilute the product. Pre-wet the surface with water (avoid puddling). Apply solution with mop, sponge applicator, paint roller or brush. Allow to dwell 30-60 minutes (do not allow to dry). Agitate with scrub brush and thoroughly rinse with clean water. For vertical surfaces such as masonry walls, use a garden hose or high-pressure washer may be used to rinse. Mop or wet vacuum up dirty solution. Heavy built-up efflorescence may require additional applications and a longer dwell time. Allow area to dry 24 hours prior to sealing area. Apply a thin coat of solution with mop, sponge applicator, paint roller or brush. Scrub into surface with scrub brush or scrub machine. DO NOT RINSE. Wipe dry any product remaining on the surface. Two to three treatments may be required to fully inhibit efflorescence. Allow area to dry 24 hours prior to sealing. Start planning your next cookout after you use this must have efflorescence remover and inhibitor!